At AlwaysFreshFish.com we pride ourselves in our Tuna. Being located on the New Jersey Shore for over 22 years we have made many contacts with local fishing boats buying the freshest and highest quality available. AlwaysFreshFish.com also purchases Tuna from throughout the world so we have a constant supply for our wholesale trade. AlwaysFreshFish.com uses "Yellowfin" Tuna which is known to be one of the world's most important commercial species. Number 1 Grade is known for Sushi/Sashimi. Number 2 Grade is great for the retail and restaurant trade. Number 3 Grade which AlwaysFreshFish.com will not use. Fresh Yellowfin Tuna is a lean meat but firm, with a large flake. Yellowfin Tuna has a definite flavor but not quite fishy. 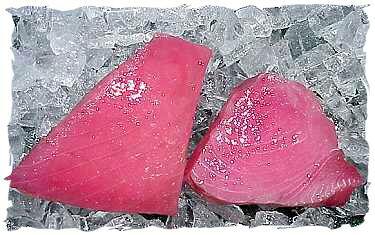 Fresh Yellowfin Tuna has a red color varying in shades from a dark red (burgundy), to a pale red. At AlwaysFreshFish.com we will process your Tuna into steaks which will be boneless. Your Yellowfin Tuna Steaks will average between 6-12 ounces. 1 lb. Fresh Yellowfin Tuna + 4 lbs. Add. Selections = 5 lb. Total Order OK! Rinse Tuna under cold water and let drain. Preheat skillet. Baste Tuna with Olive Oil and Lemon juice. Sprinkle lightly with Black Pepper. Place Steaks in hot skillet. Cook 3-4 minutes on each side or until fish flakes easily with fork. For additional information on Fresh Yellowfin Tuna, please e-mail AlwaysFreshFish.com.